Beautiful! Colour at every level! Terra it's all been said ,it is a lovely picture to look out on . A sight to behold on this damp cold dingy evening, I shall just have to imagine sitting out on your bench. Hi Ba and Stroller ..
looks lovely especially seen from the bench ..
beautiful garden your so lucky! wow have been looking at your pictures and I love your garden and all of its areas, how did you manage to get so much growth so early on with all this bad weather? It is a dream of a garden which ever way you look at it. Incredible.so much colour.Crocus is doing a great job advising your colour schemes. Hope the dogs appreciate it too. Thanks Homebird and Feverfew ..
yes you can really see the special areas you have designed look very intresting and peaceful to sit and ponder on things. lovely indeed. Like a jeweled tapestry. Beautiful as always! Your garden looks really mature and full of interest Terra. It's been a good growing year and the flowers have just kept on blooming. Terra, it would be interesting to see this same view as it looks now. It was so pretty back in May, and looking at what is planted, I bet you still have lots going on there.....? I particularly like the way you use light gravel to brighten up and draw the eye to the low level planting. That is something I shall try to imitate at the front of my new home, where there is a crazy paving patio area. I might even remove one or two stones and plant creeping thymes etc in the paving. Can't wait to get started...the waiting is soooooooo sloooooow!! Beautiful Garden Very Tidy.And Lovely planting. WOW!!! 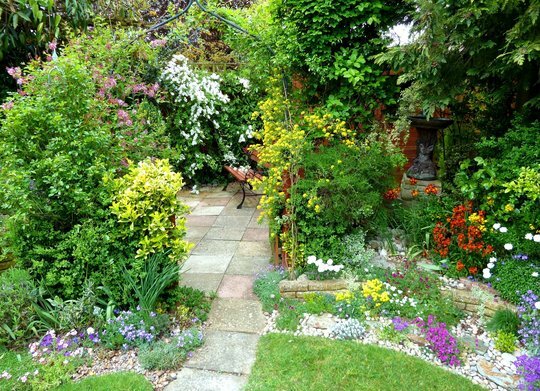 amazing garden, love this very much!!!! Your garden looks very sheltered. It obviously likes growing there. I thought I'd buy one if I could find it, but my garden is rather exposed, so I'm not sure if it would like it here. Thanks for your kind comments ... yes, my arch photo was 4 years ago, but most of the shrubs have survived, so it looks quite similar to back then. The miniature lilac is just coming into flower. It has the most amazing scent.